There is always something to be discovered at a farm. Guests are invited to accompany us and learn about our daily work in Fulpmes. Especially little holiday-makers enjoy feeding animals, such as cows, hens, goats and hares – or even help with the milking. 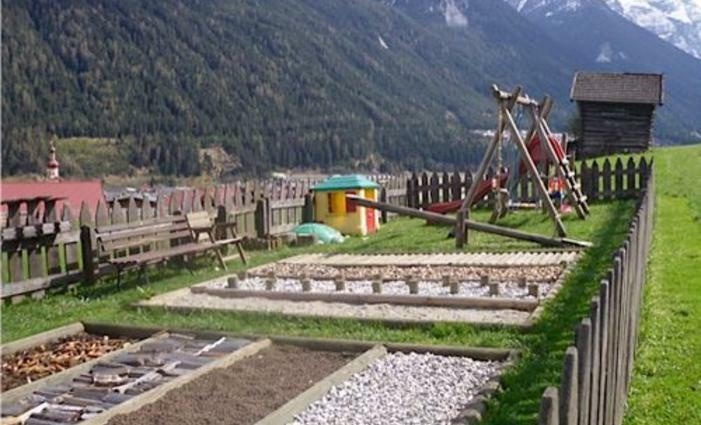 In addition to the animals, the large playground is probably the other main attraction at our farm. Slides, gymnastics, football, table tennis, basketball or trampoline –the Roas’nhof offers sufficient space to unwind. We even have a barefoot trail in the garden where you can enjoy a natural foot massage. We often join our guests on the terrace or in the arbour or organise joint barbeque nights. We regularly go on hikes together with our guests, for example, on themed hikes to the Auffangalm. Bicycle or mountain tours are equally possible, as is swimming in the many indoor and outdoor pools of the Stubaital. Since the Schlick 2000 lifts are right next to the Roas’nhof, the area’s challenging pistes are more or less on your doorstep in winter. Cross-country and winter hiking trails, ice rinks and sled runs complete the multi-facetted winter offer in the Stubaital.